City, University of London’s Department of Journalism is inviting scholarship applications from young people wanting to get into financial journalism. Thanks to the Marjorie Deane Foundation – set up in 1998 by the visionary eponymous financial journalist – successful applicants will be awarded scholarships to study for an MA Financial Journalism at City, University of London. The annual deadline for scholarship applications for MA Financial Journalism is typically 1st April for international students and 1st June for UK students. The Foundation have collaborated with The Economist and City to produce this short film, which showcases the course and profiles one recent recipient of a scholarship, LaToya Harding, who is now Business Reporter for The Daily Telegraph. LaToya credits the master’s in Financial Journalism at City for giving her the tools she needed to get a job at a prestigious national newspaper. “As a financial journalist, I’m able to cover a lot of different beats,” she says. “I could be writing about pharmaceuticals, banking, insurance, retail – finance touches every industry, there’s always a financial angle. Professor Jane Martinson, The Guardian columnist and frequent broadcast contributor who runs the course at City, says: “The MA Financial Journalism at City is unique – a master’s course which offers all the basics to become a really good journalist as well as a highly valued financial specialism. Editor-in-Chief of The Economist, Zanny Minton Beddoes, stresses the importance of developing the next generation of financial writers. “All kinds of journalism are important, but I’m particularly keen on financial journalism,” she says. “Want to understand politics today? You don't have a hope if you don't understand what happened during the financial crisis of 2008. “Want to make the world pay attention to climate change? You have to understand the economics of energy first. “Want to know why you can't afford to buy a house? You had better know what a central bank does. “If you want to track down a good story, follow the money and you will not go wrong." Marjorie Deane was born in 1914 and joined The Economist in 1947, where she worked right through to her retirement in 1989. She was initially brought in as a statistician, overseeing what is now the research department, before later moving into financial journalism. Paul Volcker, a former chairman of the US Federal Reserve, described her as "a pathbreaker for female financial journalists". From the mid-1960s, Marjorie enjoyed a ten-year spell as Deputy Business Editor before later launching a new fortnightly publication, The Economist Financial Report, which she edited for 13 years. In 1998, keen to encourage young people to become financial journalists, she donated £1 million to launch the Marjorie Deane Foundation, remaining active with its affairs up until her passing in October 2008 at the age of 94. Sue Cameron, the journalist and television presenter who wrote Marjorie’s obituary for the Financial Times, called her a “chronicler of the financial world for half a century and close confidante to the greatest names in banking”. The Economist, meanwhile, fondly recalled how “bankers willingly opened their doors to her in the knowledge that they would be talking to someone almost as well-informed as they were themselves”. She had their trust and utmost respect. 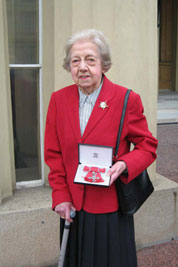 In January 2006, Marjorie was awarded an MBE for services to the finance industry. The Foundation that carries Marjorie’s name is therefore keen to usher through a new generation to chronicle the ever-changing financial world. Academic and journalistic achievement and promise. The desire to make a difference to the practice of financial journalism in your home country. A stipend is also available, subject to a financial/hardship assessment. Students should submit, by email, a covering letter, a detailed CV and a written statement explaining how you meet the selection criteria to Course Officer, Martin Chivers (martin.chivers1@city.ac.uk). This is separate to your application to study on the course. You will be required to attend an interview (either in person or by Skype or telephone) and submit a financial need statement. The scholarships can cover the full cost of tuition, and discretionary living costs, dependent on need. A full list of Marjorie Deane alumni can be found on the Foundation’s website here, as well as testimonials from recipients.